The Duratech Top Hung roof window is available in two large sizes and can be used as a means of escape or for restricted internal space applications. The window pivots at a three quarter position and is operated with the help of two gas springs and an opening handle which allows the sash to smoothly open and offers exceptional uninhibited views. 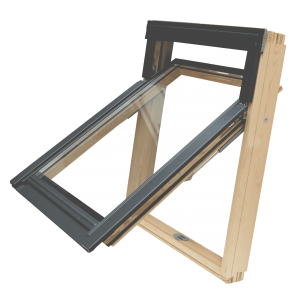 With its sleek Scandinavian Pine frame it is compliant with current means of escape window regulations and to make it child safe safety locks are also available. This window also has the added benefit of a simple click open and shut trickle vent positioned at the top of the frame, once opened the inset mesh will allow fresh, clean air into the room while the window may remain safely and securely shut. Three quarter pivoting with gas springs and an elegant handle positioned at the bottom of the window. Scandinavian Pine frames are treated with insecticide and fungicide for maximum protection.